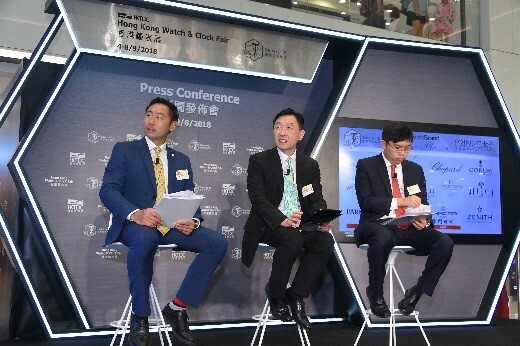 Organised by the Hong Kong Trade Development Council (HKTDC), the Hong Kong Watch Manufacturers Association Ltd and The Federation of Hong Kong Watch Trades and Industries Ltd, the 37th HKTDC Hong Kong Watch & Clock Fair will be held from 4-8 September at the Hong Kong Convention and Exhibition Centre (HKCEC). The world’s largest event of its kind, the fair will feature 830 exhibitors from 25 countries and regions, with new exhibitors from Denmark, Poland, Saudi Arabia and South Africa. The concurrent Salon de TE will open free of charge to public visitors aged 12 or above on the fair’s last day (8 September) providing a comprehensive promotional platform for the watch industry. The HKTDC Hong Kong Watch & Clock Fair has been an internationally celebrated event of the industry. Showcasing more than 140 premium international watch brands and designer collections, the sixth Salon de TE will comprise five thematic zones: World Brand Piazza, Chic & Trendy, Craft Treasure, Renaissance Moment and Wearable Tech. Sponsored by Prince Jewellery & Watch for the ninth consecutive year, the World Brand Piazza will present 13 renowned international brands, including two newcomers – PARMIGIANI FLEURIER and SARCAR Genève – as well as returning brands Blancpain, Breguet, Chopard, CORUM, FRANCK MULLER, Glashütte Original, Jacob & Co., Jaquet Droz, Juvenia, Piaget and ZENITH. DAUMIER at the Chic & Trendy zone will present the DEVIA collection, with only 333 pieces available worldwide. Inspired by Batman’s helmet and armor of Justice League, this collection features a stereoscopic three-dimensional watch dial and a new design of scale discs, showcasing the minimalistic but playful style of European designs. Another Swiss timepiece Van Gogh C-SLLA-18 is a sophisticated and artistic piece that commemorates Vincent van Gogh’s 160th anniversary in 2013, featuring a stainless-steel case, genuine leather strap and a small, separate seconds dial. Craft Treasure will present high-end functional mechanical watches and jewellery watches. Among them is the Hong Kong brand Memorigin’s Stellar Series – Imperial, a timepiece featuring a case set with a highly transparent sapphire crystal. The spinning tourbillon mechanism shows the galaxy in multiple angles, while the globe-like component shows the time in different international zones, making it most suitable for frequent travellers. Renaissance Moment will display works from a number of classic and renowned European brands. The Swiss Independent Watchmaking Pavilion will return to showcase premium Swiss watches. Besides the returning brands Adriatica, Mathey-Tissot, Pilo & Co and WATCHe, six new exhibiting brands Carl Suchy & Sohne, David van Heim, Greco Geneve, L. Kendall, Meccanica Grezza and Vincent Calabrese will also showcase a wide array of Swiss watches. Wearable Tech will present smart watches combining the latest technology and functionalities including SMA from the Chinese mainland and Garmin from the US. To match the international market’s need for innovative designs, the Pageant of Eternity zone will return with close to 200 exhibitors showcasing high-end complete watches from original equipment manufacturers (OEM) and ODM companies, including Owago Limited, Citizen Watch and Time Industrial Manufactory from Hong Kong. Time Industrial Manufactory’s TIMEIN / 7991G features a combined design concept of business, classic and sports in one, where the watch case is equipped with a small window to view the movement. Citizen Watches’ Cal.9039 has a slim and simple movement design that suits the trend and demand for slim mechanical watches. The Watch & Clock Fair will feature other thematic zones to facilitate buyers’ sourcing, including OEM Smart Watches, Complete Watches, Clocks, Machinery & Equipment, Packaging, Parts & Components, Trade Services and the hktdc.com Small Orders zone. During the fair period, around 30 events will be organised to help industry players connect and share market information. The Hong Kong International Watch Forum on 4 September will gather industry elites to examine new trends and future industry developments, while the Asian Watch Conference (5 September) will feature the famous Swiss watchmaking expert Elmar Mock. As a former engineer at renowned Swiss watchmaker Swatch, he will share his insights on how to turn ideas into reality, and Swatch’s design stories. Jorge Martin from Euromonitor International will investigate the role of smart pieces and forecast digital developments. Iconic watch maker and co-founder of Académie Horlogère des Créateurs Indépendants Vincent Calabrese will introduce the sophisticated creation of tourbillon watches. Watch parades and product launches will feature celebrities including entertainers Jacquelin Ch’ng, Joel Chan, Chin Ka-lok, Ronald Cheng and Mark Lui, as well as racing driver William Lok, famous auctioneer Jin Ling, climber Xia Boyu and bowling player Wu Siu-hong. On the Public Day (8 September), Salon de TE will open free of charge to public visitors aged 12 or above. Visitors can enjoy a series of watch parades, “fashion x watches” parade, product launches, watch-collection sharing sessions and lucky draws. The HKTDC will stage the international fashion event CENTRESTAGE concurrently (5-8 September) at the HKCEC to showcase fashion brands and designer collections, bringing more cross-over business opportunities to exhibitors. To help raise the design standards of Hong Kong watch brands and nurture budding local designers, the HKTDC Hong Kong Watch & Clock Fair 2018 Organising Committee, together with the Hong Kong Watch Manufacturers Association Ltd and The Federation of Hong Kong Watch Trades & Industries Ltd, co-organise the 35th Hong Kong Watch & Clock Competition. The competition was divided into Open Group and Student Group categories, with the theme “Innovative Craftsman” and “Colourful World” respectively. This year, the competition received about 100 entries. Winning and final entries will be displayed at the Hong Kong Watch & Clock Fair at Hall 1B concourse to showcase the best of Hong Kong’s creativity to international buyers. With technology advancement, the HKTDC is launching the e-Badge initiative at this year’s Watch & Clock Fair for the first time. Buyers can retrieve the environmentally friendly e-Badge from the HKTDC Marketplace mobile app after registration. When entering the fairground, buyers can simply enable the Bluetooth function on their mobile device to obtain a “green tick” on the e-Badge and show it to staff for seamless fairground access. The mobile app also allows visitors to access exhibitor and fair information and enjoy a more convenient, comprehensive and environmentally friendly trade fair experience.